Don’t be put off by the title - this is one of the great books on coarse fishing, the more so because it was written by the champion of the working man, J.W. Martin, who began as a labourer and ended up as a respected London tackle shop owner and the friend of angling giants like R.B. Marston, the editor of the mighty Fishing Gazette. 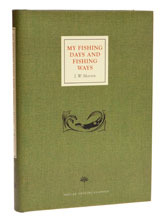 As Martin points out in the preface to the 1906 edition, this isn’t a ‘how to’ book, but instead a collection of tales about fishing he had enjoyed, or learned from; some of the stories aren’t even about fishing, for example the one about the old man and the black powder gun in the first chapter, which more or less sets the scene for the rest of the book. Martin was getting old and must have known he didn’t have much time left, so he writes about everything from his first experiences of fishing for roach in the Fens as a boy back in the 1860s, to a rare account of dibbing for chub and about Thames trout. Very few people had seen anything like as much fishing as Martin and if you like reading about times past, there are few books to compare with this one, not least because Martin wrote for working men and didn’t beat about the bush when it came to talking about the conditions that he knew his readers had to live and work in. Good social comment and great writing, but you would need to be interested in angling history to get the most out of this one.